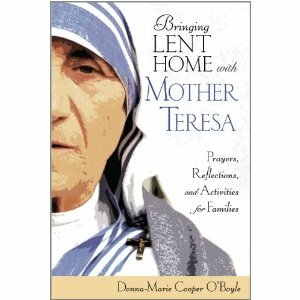 Bringing Lent Home with Mother Teresa for more than Lent! "We have enjoyed this book very much throughout Lent this year, especially the little glimpses of Mother Teresa's life interwoven with each day's reflections. 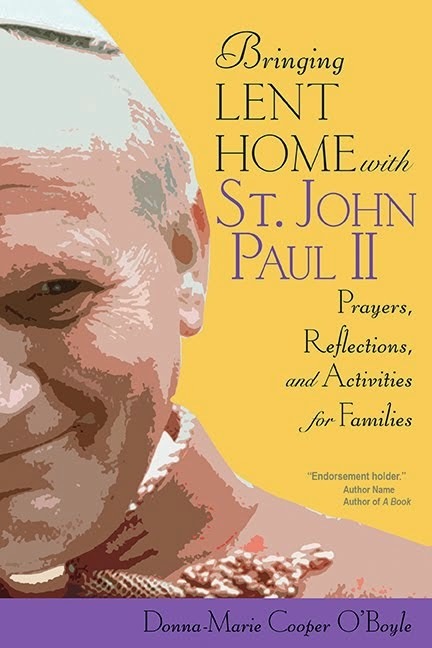 Though more sporadic than we'd hoped, our family's experience with "Bringing Lent Home" has been a blessing each time we've picked up the book. Forget consigning it to the 40 days of Lent, this book is a good springboard for families in their discussion and prayer time any day of the year. 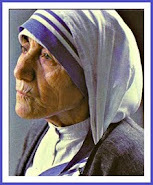 Blessed Mother Teresa, ora pro nobis +"
[this review was found on Amazon] A heartfelt thanks to the reviewer! I'll be on "Pathways of Faith" radio show TODAY from 12:00 noon Eastern until 1:00 PM. I hope you can join me! Daily Donna-Marie: A Dose of Inspiration: Irish soda bread I hope you enjoy it! Here's the launch of my new radio show, "Food for the Family's Soul" on "The Bishop's Radio Hour" which will be brought to you each month, God willing. 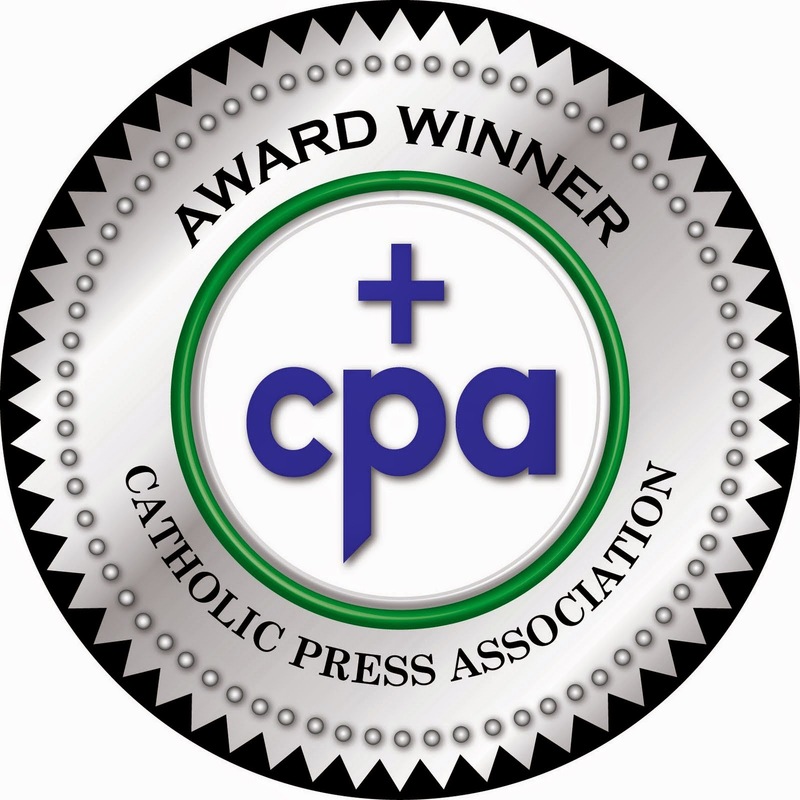 Bob Dunning and I will be sharing about Catholic family issues. I hope you can join us. I'll post a reminder in advance of the show and hopefully also post a link to hear it afterwards in the archives. Ever wish you had a cookbook for life as a Catholic wife and mother...a step-by-step guide for various "domestic church" situations? Consider your prayers answered. The recipe themes may be lighthearted, fun even, but there's real nourishment to be had in this wonderful dish too. 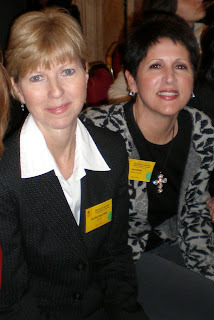 Inspiring entrees--practical ways Catholic women can live out their familial vocation--are seasoned with simple suggestions for answering Christ's universal call to holiness. A special section of lovely poems and prayers end the book on a note of warmth that will lift hearts beyond the kitchen and up towards heaven. 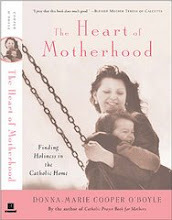 Filled with uplifting stories and advice for Catholic mothers. 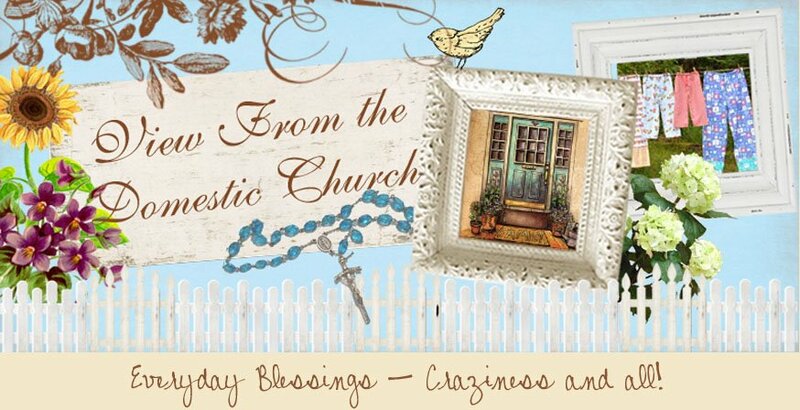 Each chapter ends with a recipe card which has a "recipe" for all different issues regarding Catholic mothering. The end of the book holds verses and prayers for mothers written to uplift, affirm, and encourage. 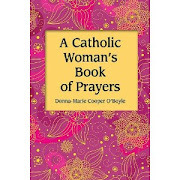 Donna-Marie Cooper O'Boyle provides levity and strong spiritual advice in this recipe themed instruction manual for Catholic wives and mothers. Paperback. 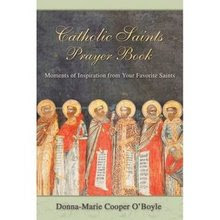 219 pages - $14.95 NOW ON SALE FOR LENT! Regularly $14.95 each, now only $10.00 each or 2 for $18.00! Use these pay pal buttons below to order to receive the sale price. "How do I get my family to spend more time together and treat Sundays as the Lord's day?" I set the tone in my home for Sundays, and I also set the parameters and expectations for my family regarding Mass and Sunday dinner: not planning unnecessary shopping trips by fostering an atmosphere of rest and fun with friends and relatives, and hopefully even finding a quiet time to ponder and pray. 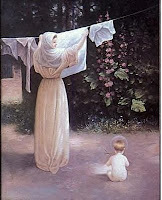 "I remember when I was a little girl drying dishes after dinner each evening while my mother washed. I never thought of it being a painful or annoying chore. I actually enjoyed it because I was doing something with my mother. I was always bursting at the seams to let my mother in on the latest clues I had discovered in the many adventures of the Nancy Drew books I was reading at the time. She listened intently as I chattered away to her. She seemed very interested in me recounting the stories. In no time, the dishes were all clean, dried, and put away. There were other times when--in between the Nancy Drew talk--I could casually insert something that was on my mind. It was my mother's and my time to talk as she passed the clean dishes to me, an I dried them and put them away. Don't be afraid to get your kids involved with household chores. You can make it personal by investing time in your conversations with them while you are busy with your tasks. As a mother, I have found that sometimes it is much easier to have a discussion about an important or sensitive topic while doing something side by side rather than face-to-face with our children. Children are more apt to open up to us while we are spending time with them..."
‎"At times, we may set aside a special prayer time in which we hope to have at least a few quiet moments of spiritual reading and meditation. We prepare to meet with our Lord: kneeling, hands clasped, ready to pray--and suddenly our toddler runs in after waking up early from a nap, fully energized and in need of our immediate attention. 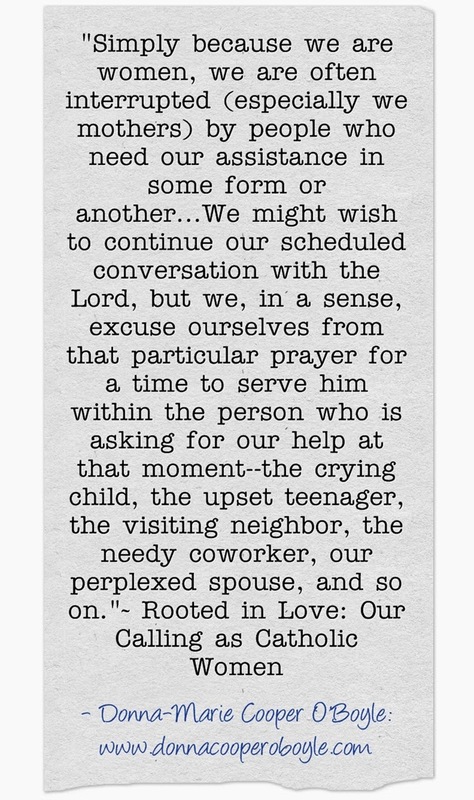 Or at times a distraught relative calls...There should be no concerns about a lost time with Jesus because our arranged prayer time was interrupted. We serve God in our children and in others. 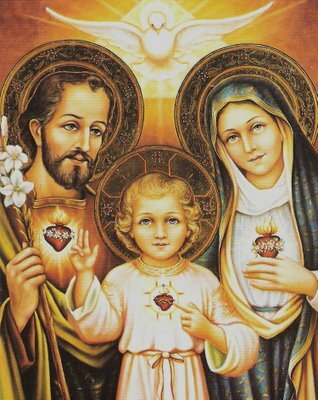 Our Lord hears our prayers..."
Lean your head on Mary's heart: Mary works miracles! Radio Show: "A Cup of Tea with Donna-Marie"